I just noted on Wicked_Edge that we are seeing the unbundling of razors. And right now I’m thinking of buying a baseplate (separately): really unbundled. Specifically: I have the ATT safety-bar slant head (purchased separately as head only) on a UFO razor handle (purchased separately as a razor handle), and now I’m thinking of buying the ATT S2 baseplate by itself to use with that handle and cap.
. . . The right should greet it with the skepticism they’d typically summon for a rally on behalf of government workers as they seek higher pay, new work rules, and more generous benefits. What’s unfolding in New York City is, at its core, a public-employee union using overheated rhetoric and emotional appeals to rile public employees into insubordination. The implied threat to the city’s elected leadership and electorate is clear: Cede leverage to the police in the course of negotiating labor agreements or risk an armed, organized army rebelling against civilian control. Such tactics would infuriate the right if deployed by any bureaucracy save law enforcement opposing a left-of-center mayor. It ought to infuriate them now. Instead, too many are permitting themselves to be baited into viewing discord in New York City through the distorting lens of the culture war, so much so that Al Sharpton’s name keeps coming up as if he’s at the center of all this. Poppycock. Credit savvy police union misdirection. They’re turning conservatives into their useful idiots. If the NYPD succeeds in bullying de Blasio into submission, the most likely consequence will be a labor contract that cedes too much to union negotiators, whether unsustainable pensions of the sort that plague local finances all over the U.S., work rules that prevent police commanders from running the department efficiently, or arbitration rules that prevent the worst cops from being fired. Meanwhile, Al Sharpton will be fine no matter what happens. Will the law-and-order right remain blinded by tribalism or grasp the real stakes before it’s too late? Look toNational Review and City Journal before laying odds. It’s pretty obvious that the police union is facing off in a direct contest of which will run the city—the police and their unions? or the elected government of the people? I can see which the police and their unions would favor, but why would anyone else not favor letting their own elected government be the boss? The CIA apparently were ignorant of these advances and simply resorted immediately to torture, the most brutal they could devise beneath a (transparent) veneer of legality. Here’s the New Yorker piece by Dexter Filkins. C. J. Chivers has a somewhat depressing article in the NY Times today. It’s a lengthy article, but it’s definitely worth reading. Daniel Mould’s sense of abandonment was profound. An Air Force staff sergeant wounded in a chemical weapon accident in 2004, he willingly helped the military study his wounds. From his bed in a Philadelphia burn ward, as blisters from sulfur-mustard agent erupted on his skin, he signed a waiver allowing doctors to gather his body fluids to experiment with new laboratory methods for confirming chemical exposure. Over the next 18 months, as the military gave him attentive care and doctors prepared peer-reviewed journal articles about his case, another branch of the service, the Army, concluded that it needed to be exhaustive in tracking troops exposed to chemical warfare agents: Citing Sergeant Mould’s burns, it called for monitoring victims for life. The case seemed a welcome example of the military’s working closely with a patient to improve understanding of a rare battlefield risk and to develop practices to learn from patients’ medical experiences. Then came the shift. In October, reacting to an investigation by The New York Times, the Army surgeon general’s office announced that it would begin monitoring the long-term health of all veterans exposed to nerve or blister agents during the American occupation of Iraq. The victims had been kept secret as long as a decade, and the Army’s treatment guidelines had not been followed. For Mr. Mould, 45, who had never spoken publicly about the accident, the irony of the Army’s announcement was startling. Even the person whose wounds spurred one branch of the military to call for tracking exposed veterans had not been enrolled in long-term monitoring — by either the Pentagon or the Department of Veterans Affairs. The origins of his case span almost a century of American chemical-warfare policies, and like the experience of Iraq — where troops were wounded by abandoned chemical weapons — his example speaks to the persistent dangers presented by discarded or forgotten munitions. Almost all of the military’s previous chemical-exposure victims had been World War I veterans or human subjects in classified military tests during World War II and the Cold War. The latter group, tens of thousands of enlisted men, were systematically exposed to nerve and blister agents in gas-chamber tests, field exercises or other efforts to evaluate protective equipment and human reactions to chemical-warfare agents. Often the human subjects were sworn to silence. The Pentagon denied their existence for decades, until victims came forward with medical claims, prompting a 1993 review of the military’s conduct by the National Academies’ Institute of Medicine, which noted “a well-ingrained pattern of abuse and neglect” of the human subjects, some of whom had been duped into consent. Tracking exposure victims is important, military and health officials say, because blister and nerve agents can carry long-term effects. Sulfur mustard, for example, can cause lingering respiratory difficulties and is carcinogenic, although precise risks have proved hard to measure in the limited studies to date. That legacy of squandered opportunities appeared to change by 2004, when Sergeant Mould was burned. His wounding was like a case study in the long-lasting dangers of modern weapons. In 1917 and 1918, the United States brewed chemical agents for use on Europe’s front lines, only to find it had little storage capacity for thousands of tons of chemical artillery shells that had not been fired before the armistice in 1918. The Army found a solution: Dump them off the East Coast. “War Gas Dumped Far Out At Sea,” read the headline on a New York Times article in 1919, which noted that one vessel dropped 200,000 shells overboard between 60 and 100 miles out. Little is known of the locations of many shells, which were scattered by multiple ships. But out of sight did not mean out of reach. One shell intersected with Sergeant Mould more than eight decades later, after the police found a rusted artillery projectile at a chicken farm in Delaware in the summer of 2004. The projectile had been brought ashore by a fishing vessel and delivered to the farm with a load of crushed clamshells to be used as roadway fill. Sergeant Mould, at the time assigned to an explosive ordnance disposal team on Dover Air Force Base, was dispatched to pick up the shell and bring it back the base. There, he said, he and a more senior noncommissioned officer misidentified it as a conventional, high-explosive 75-millimeter round. The next day, Sergeant Mould’s team was assigned to destroy the shell. The plan was to breach it with a small shaped charge, causing its suspected contents to burn out and minimizing the risk of a larger blast or fragmentation. After the team detonated the shaped charge, Mr. Mould recalled later, something was clearly wrong: The shell was leaking a “liquid about the consistency of vegetable oil and black as the ace of spades.” The liquid, he said, smelled like hot asphalt. For nearly a decade, the United States government kept secret that troops were being injured as they stumbled across aged chemical weapons that Saddam Hussein had built for his war with Iran. Explore the original Times investigation, eyewitness accounts from victims and the developments that led to the Pentagon’s response, policy changes and follow-up care. The “Broken Windows” theory of crime: Broken? Some of the cities did “broken windows” policing, some did not. 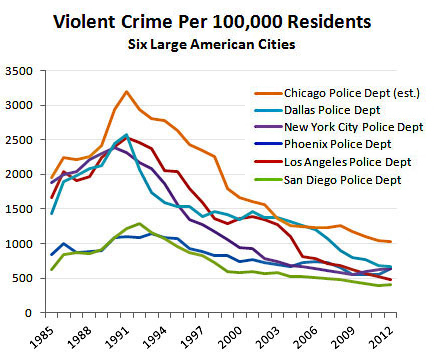 Not much difference in crime-rate trends, though. That suggests that something else was causing the decline. A really terrific shave today. I forget how very good the Edwin Jagger head is. But first the prep. I wet the horsehair knot thoroughly before my shower, and by the time I was ready to shave, the brush was ready. The usual MR GLO pre-shave beard wash, then I rubbed Mama Bear’s Spellbound Woods over all my beard. I really like the fragrance of this one a lot. The lather was immediate and thick—a great lather, in fact. And the Edwin Jagger head on a Weber Bulldog handle makes a very nice razor indeed. With a SuperMax Titanium blade I achieved a trouble-free BBS result in three easy passes. 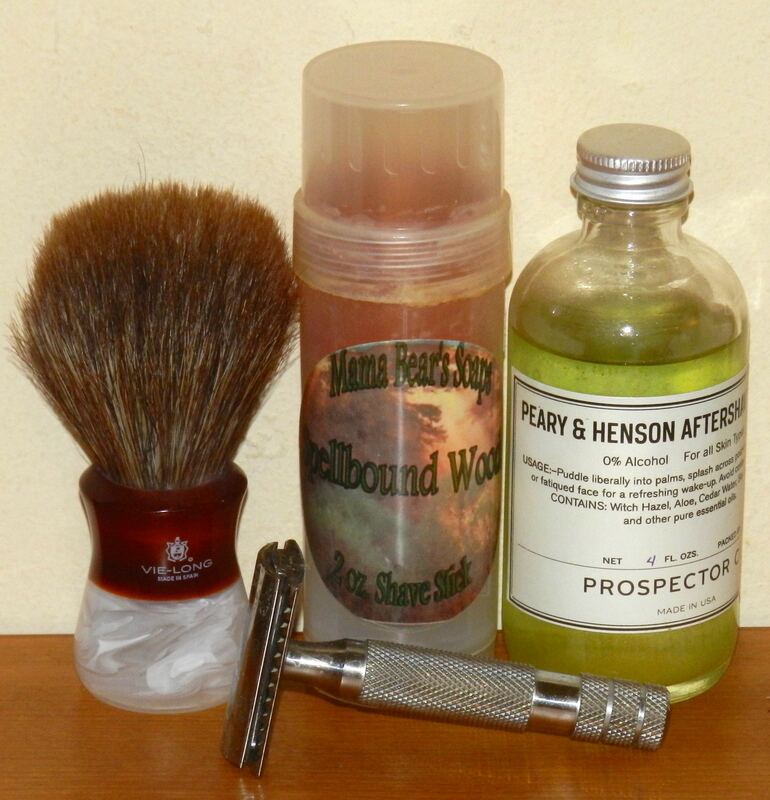 A good splash of Peary & Henson aftershave from ProspectorCo.com, and I’m ready to see the start of a new year once more.